Everyone from novice to expert can build sophisticated tests for desktop, web, and mobile. Accelerate testing for desktop, web and mobile applications. Ranorex Studio empowers testers with a complete toolset for end-to-end testing of desktop, web and mobile applications in a single license. Automate tests on a Windows desktop, and then execute them locally or remotely, on real iOS or Android mobile devices or on simulators/emulators. Run tests in parallel and accelerate cross-browser testing for Chrome, Firefox, Safari, Microsoft Edge, and more. With Ranorex Studio, you and your team will spend less time resolving issues with unstable tests and more time assessing the quality of your application. Rapidly build and deploy reliable, maintainable automated tests – with or without coding. Easy-to-use tools and a built-in methodology enable testers to create modular automation scripts that are efficient and maintainable, regardless of programming expertise. Reach your test automation goals faster with Ranorex Studio. Keep your project on track with timely reports.Monitor the results of testing with an overview of the test execution flow, including pie charts, screenshots, and detailed error logs that are easily readable for testers, developers, and project managers alike. View a comprehensive test report within Ranorex Studio, save it as a PDF or automatically receive it as an email attachment. Customize the report to fit your needs. Generate JUnit-compatible reports for easy integration with CI tools. 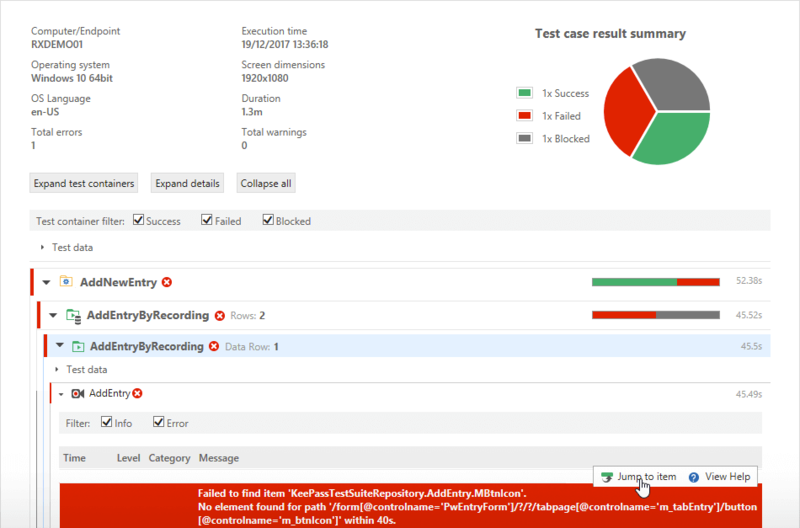 Reduce debugging time with video reporting of test execution. Jump directly into a failed test step from the test run report, or use the maintenance mode to repair tests on the fly while the test is still running. 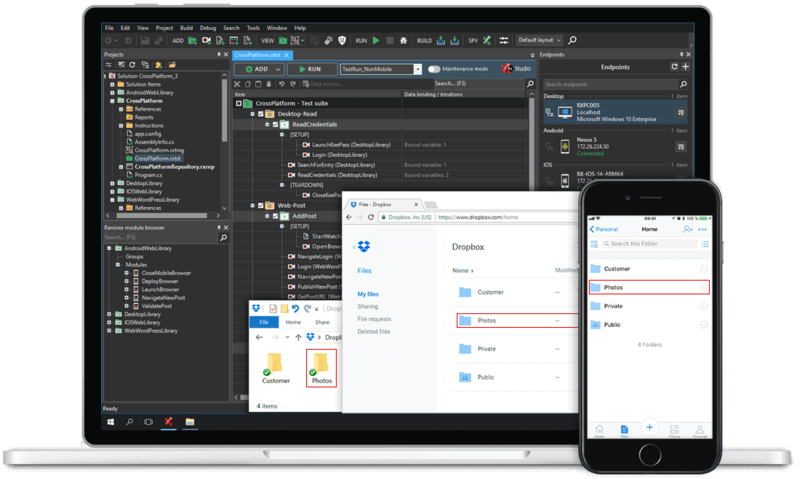 Whether you are testing a legacy desktop application or a native app for the latest mobile devices, a single Ranorex Studio license includes the technologies that you need. To read more about Ranorex Studio’s support for a specific technology, click one of the links below. Foster collaboration with easy-to-use tools for codeless automation and a full IDE. Drag the slider bar to the right to see how easily beginners can build sophisticated tests with our codeless automation tools. 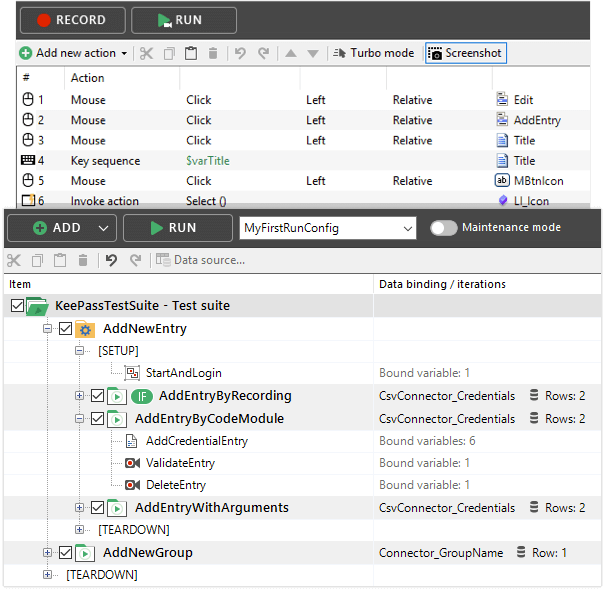 Use powerful capture-and-replay functionality to record test actions. Add field validations and capture screenshots while recording. Drag-and-drop GUI elements or user code modules from the team’s shared repository into recorded actions. Easily build data-driven tests by adding links to data tables, spreadsheets or databases. Point-and-click to add parameters or conditions to test cases. 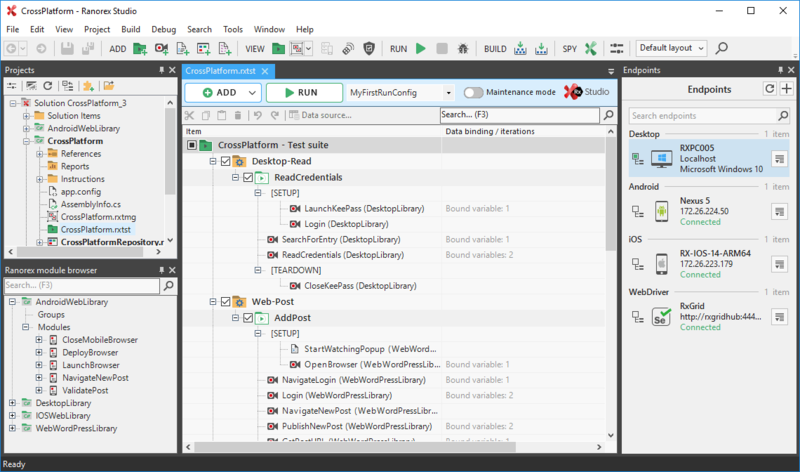 Drag the slider bar to the left to see Ranorex Studio’s integrated development environment for testers who prefer to build automation modules using standard programming languages. 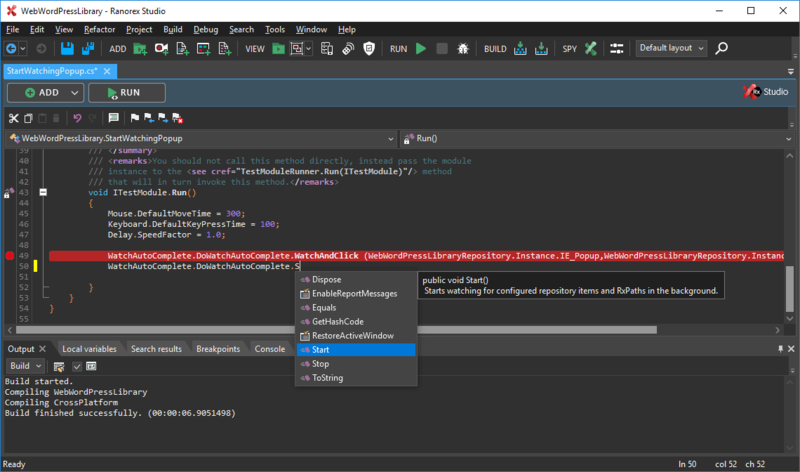 Our full IDE for C# and VB.NET includes productivity features such as intelligent code completion, tools for debugging and refactoring, automation helpers, and more. Boost team productivity by creating and sharing automation modules as user code collections and methods. Collaborate effectively with support for source control and the Ranorex Magic Merger tool. A Ranorex Studio license includes access to our expert support team as well as software maintenance. Need help deciding if Ranorex Studio is the right solution for your test automation goals? Our knowledgeable sales team will assist you through a “proof of concept” evaluation. Ranorex also offers value-add services to maximize the effectiveness of your Ranorex implementation and to ensure long-term success. Gain valuable test automation skills in the way that best fits your needs. Watch live and on-demand webinars that cover topics from getting started through best practices. Or, connect with one of our training partners to learn more about onsite and online training. A certification program is available for testers who are ready to demonstrate their expertise with Ranorex. The Ranorex Help Center is your one-stop shop for mastering test automation with Ranorex, with resources that will take you all the way from novice to expert. 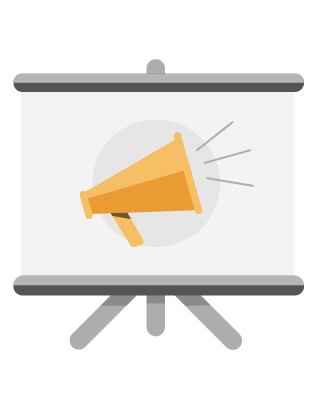 In addition to our detailed user guide, you will find tips for best practices, release notes, FAQs, “how to” screencasts, the Ranorex user forum and more. The tools you need for success are just a click away! Get the best value for your investment. You never have to pay extra to add on tools or technologies with Ranorex Studio. Everything is included in one license – desktop testing, mobile device testing for iOS and Android, cross-browser testing for web – as well as all major and minor software updates, professional support, and a wealth of learning resources. Are you ready to take the next step? Download the full version of Ranorex Studio, free to try for 30 days.